Begin by slicing into the mango, cutting along the edge of the pit, and repeating on the other side. Once you have both sides sliced off, you have two options! Option 1: Gently make vertical cuts in the mango, making sure not to cut through the skin. Option 2: Repeat the vertical cuts along the mango, as well as horizontal cuts, creating squares. Once you have made your desired cuts, you can either remove the fruit with a knife or spoon. If using a spoon, insert it between the mango fruit and skin, running it along the skin until the fruit falls out. 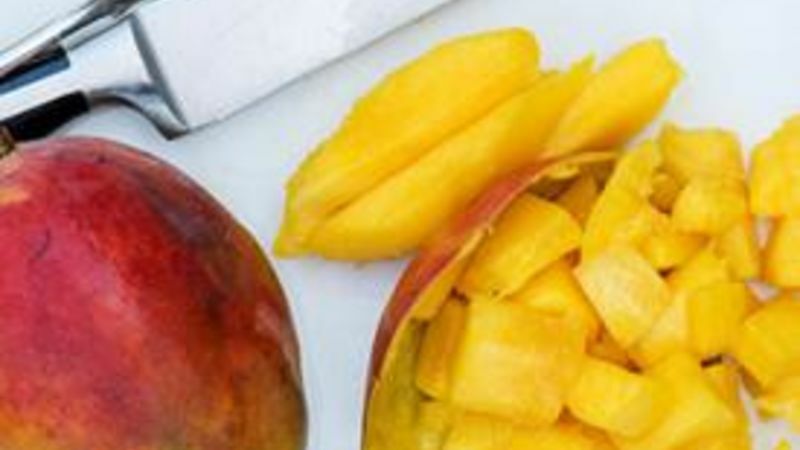 To cut it away with a knife, pop the mango, turning it inside out, and cut away the fruit. If there is any fruit left on the pit of the mango, slice away any skin and cut around the pit to remove the rest of the fruit. A lot of people do – it’s often cited as the world’s most popular fruit. My only beef: cutting them up can be a messy disaster. If you don't know the secret, that is! Okay, so it really isn't a secret. But for a long time I would slice the skin off, then while failing to get a solid grip on the slippery fruit, I would hack away at it until most of the fruit came off the pit. This resulted in a pile of horrific mango slices and me wondering "Whyyy can't you just be like a peach, you mango?!" Maybe that last part was a little dramatic (and maybe it didn't actually happen) but inside I was definitely cursing that delicious fruit for being so hard to remove from its pit! Fortunately, along came this wonderful thing known as "proper cutting technique", changing the way mangos were sliced forever. Begin by slicing into the mango, cutting along the edge of the pit, and repeating on the other side. Once you have both sides sliced off, you have two options. Option 1 (right side): Gently make vertical cuts in the mango, making sure not to cut through the skin. Option 2 (left side): Repeat the vertical cuts along the mango, as well as horizontal cuts, to create squares. Once you have made your desired cuts, you can either remove the fruit with a knife or spoon. If using a spoon, insert it between the mango's fruit and skin, running it along the skin until the fruit falls out. To cut it away with a knife, "pop" the mango, turning it inside out and cutting away the fruit (watch the video above to see what I mean). If there’s any fruit left on the pit of the mango, slice away any skin, and cut around the pit to remove the rest of the fruit. That's it – you’re on your way to eating glorious mango!